Amanda sent a story of a cat who rides the bus. According to the London Daily Mail, a mystery cat has been hitching a ride for the past few weeks. 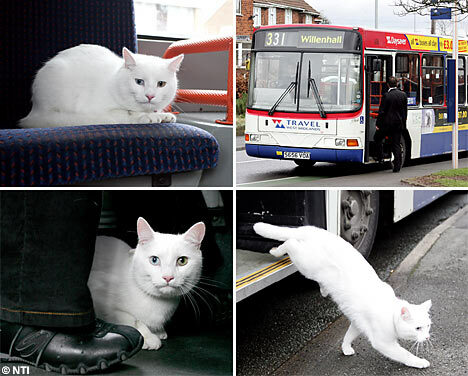 The feline, which has a purple collar, gets onto the busy Walsall to Wolverhampton bus at the same stop most mornings — he then jumps off at the next stop 400m down the road, near a fish and chip shop. The cat was nicknamed Macavity after the mystery cat in T.S Elliot’s poem. He gets on the bus in front of a row of 1950s semi-detached houses and jumps off at a row of shops down the road which include a fish and chip shop. Driver Bill Khunkhun, 49, who first saw the cat jumping from the bus in January, said: “It is really odd, the first time I saw the cat jumping off the bus with a group of passengers. I hadn’t seen it get on which was a bit confusing. “The next day I pulled up on Churchill Road to let a couple of passengers on. As soon as I opened the doors the cat ran towards the bus, jumped on and ran under one of the seats, I don’t think any of the passengers noticed. Passenger, Paul Brennan, 19, who catches the 331 to work, said: “I first noticed the cat a few weeks ago. At first I thought it had been accompanied by its owner but after the first stop it became quite clear he was on his own. This story’s almost too strange to be believed. The photos only add to my consternation. There are 4 reader responses to "The Cat Who Rode the Bus". The article mentions in passing that the cat has one green eye and one blue, but never says why this makes the story that much more amazing: A white cat with different colored eyes is deaf from birth. Not all cats with odd eyes are deaf. I have a white male Turkish Angora with one blue and one gold eye and he hears perfectly well. Does he hear perfectly well? Perfect passenger my foot! The cat doesn’t pay! If I had to make a guess, I’d say the cat is one of the breeds, or individuals that “behave like dogs” and maybe had an owner who took him/her on the bus. This became either a habit, or a pleasurable experience for it, so it continues to use the bus to explore.